Europe has many, magnificent castles and walled cities - many from medieval times. Here are a few which, in our opinion, stand out from the rest. Many people view Carcassonne as the finest example of a medieval city anywhere in Europe. Dating back to the 13th century, Carcassonne greets the visitor with turrets, towers and cobblestone streets. 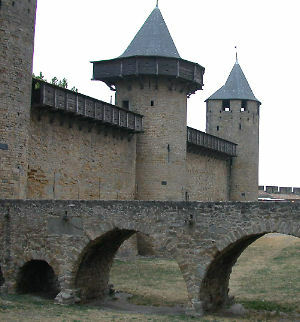 One of the legends associated with Carcassonne dates back 1,200 years to when Charlemagne lay siege to the town. The siege lasted years and as food was running out one of the town’s women came up with an idea to outsmart the forces bearing down on them. She fed the very last remains of food (probably grain) to the very last pig in the town and then threw it over the wall. Charlemagne's soldiers on the other side of the wall were shocked to think that the town had enough food to throw away fat pigs so, believing that their efforts would never succeed in starving the people out, they ended the siege. Carcasssonne was saved. A medieval castle with fairytale like turrets up in the hills above the Moselle River (near Koblenz), it remains in the hands of a branch of the same family who lived at the castle in the 12th century. A romanesque keep (believed to be the oldest part of the castle), 8 towers each reaching skwyards up to around 40 metres and strong, stone fortified walls all make for an impressive sight from a distance. High up on a hill, Rheinfels Castle is the largest castle overlooking the river Rhein. Constructed in 1245 AD, the castle remained intact for over 500 years beforebeing partially destroyed in 1797 AD by French Revolutionary Army troops. The ruins that are still visible today are nonetheless impressive and some ofthe outer buildings have been converted into a luxury hotel andrestaurant. "in the authentic style of the old German knights' castles"
For that reason it has strong medieval styling and many connections to medieval legends in its interior decorations. 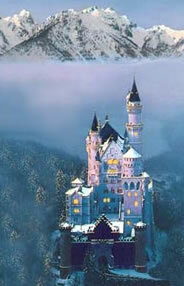 Many people view Neuschwanstein Castle as the ultimate fantasy castle. Breathtakingly bold architecture combined with a stunning mountain setting make Neuschwanstein Castle one of the most famous and well loved castles in the world.